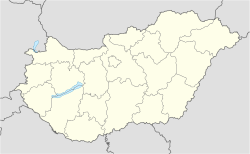 Péteri is a village in Pest county, Hungary. It is situated between the towns of Monor and Üllő, immediately east of the Budapest International Airport. Péteri has an Evangelical church. ^ Péteri at the Hungarian Central Statistical Office (Hungarian). This Pest County location article is a stub. You can help Wikipedia by expanding it. This page was last edited on 12 March 2019, at 17:51 (UTC).